Since the arrival of Jurgen Klopp, Liverpool have repeatedly been lined with a move for Borussia Dortmund star Ilkay Gundogan, and new developments this week suggest that Reds will have a chance to sign the £25m-rated midfielder this summer. "There are no new developments yet. Liverpool have a good team, and a great coach. I want to deal with [my future] in a respectful way and will make a decision [soon]". Well, it appears that Gundogan - described by Klopp as an 'extraordinary player' - has made his decision, and it's (potentially) good news for Liverpool. * After 'protracted' talks, Gundogan has told Borussia Dortmund that he will not sign a new contract. * Jurgen Klopp is still 'keen' to bring Gundogan to Anfield. Arsenal and Man city are also interested. 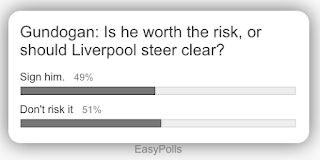 If Gundogan wants out, then Liverpool have a great chance of sealing a deal, and with Klopp at the helm, the Reds should (in theory) have an advantage over other teams. Granted, he has a patchy injury history, but one major issue aside (400 days out during the 2013-14 season/88 games missed), the German never missed more than one game at a time. Gundogan's fitness also appears to be holding up this season, and so far, he has made 32 appearances for Dortmund (9 goals/assists - averaging 82 minutes of playing time per game). If Liverpool sign Gundogan, then it's surely curtains for Emre Can as a regular first-teamer? If Jordan Henderson remains as captain, he'll surely play the majority of games (fitness permitting).